Auf welcher Straßenseite man sich befindet hat großen Einfluss auf einen sinnvollen Fußweg im Stadtgebiet. Besonders für Menschen mit Blindheit oder anderen Sinneseinschränkungen spielt es eine große Rolle, wo man Straßen sinnvoll überqueren kann. Bisher allgemein verfügbare Lösungen für Fußgängerrouting bzw. Pedestrian Routing berücksichtigen jedoch i.A. keine Straßenseiten. 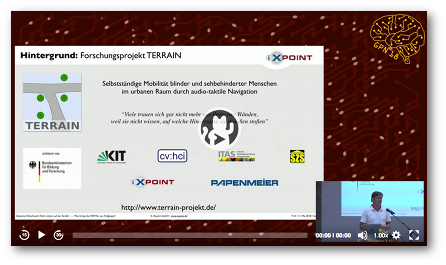 Im Rahmen eines Pedestrian-Routing-Testinterfaces stellt die iXpoint Informationssysteme GmbH den Entwicklungsstand des im Terrain-Projekt entwickelte Fußgängerrouting zur Verfügung: Hier werden möglichst sinnvolle Fußwege für Menschen mit Blindheit in Deutschland, Österreich oder der Schweiz gesucht und auf einer Karte dargestellt. Das Testinterface stellt die Wegfindung visuell in einer Kartendarstellung zur Verfügung und steht daher aktuell nur sehenden Personen zur Verfügung, und ermöglicht insbesondere die Evaluation der Datenbasis für die OSM-Community. Die Nutzung im Projekt erfolgt barrierefrei auf Smartphones mit Sprachansagen und optionalen weiteren Signalen wie Vibration und Tönen. 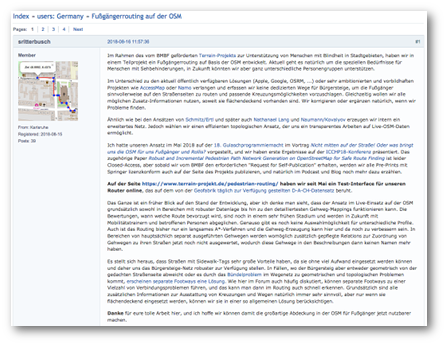 Im Rahmen der Gulaschprogrammiernacht 2018 wurden im Vortrag „Nicht mitten auf der Straße“ technische Hintergründe zum Fußgängerrouting auf Basis von Daten in der OpenStreetMap (OSM) präsentiert. In der Presentation werden die besondere Herausforderungen für Fußgängerrouting, die aktuell verfügbaren Lösungen und bisherigen Ansätze im Vergleich zur neuen Methodik vorgestellt und illustriert. S. Ritterbusch, H. Kucharek. 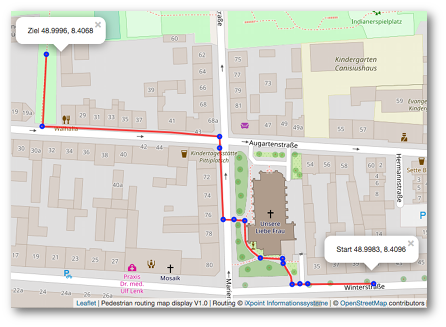 Robust and Incremental Pedestrian Path Network Generation on OpenStreetMap for Safe Route Finding. In: Miesenberger K., Kouroupetroglou G. (eds) Computers Helping People with Special Needs. ICCHP 2018. Lecture Notes in Computer Science, vol 10897. Springer, Cham, 2018. Eine frei verfügbare Preprint Fassung wird in Kürze zur Verfügung stehen. In urban, unknown spaces it is often difficult for people with blindness or visual impairment to find their way around. The different environments such as city centres, parks or forest paths place diverse demands on orientation and mobility. A lack of local knowledge and orientation problems can lead to blind people not using some areas of the city, such as local recreation areas. This results in a limited range of movement and social isolation. Assistance systems – which help to identify obstacles and points of orientation when navigating in public space – can noticeably improve the quality of life. The aim of TERRAIN is to develop a portable assistance system to support the mobility of blind and visually impaired people in urban areas. The system combines navigation based on digital map data with camera-based image processing methods. Paths, obstacles, traffic lights, road crossings as well as interesting landmarks, buildings and objects are detected. To this end, an accessible, acoustic and haptic user interface is being developed that can be adapted to the needs and preferences of users. A new type of mobile, wirelessly connected Braille display will also be integrated. With TERRAIN, decisive hurdles in mobility and navigation are overcome and confidence in the users‘ own movement and mobility abilities is strengthened. Everyday paths can be done independently; activity and social contacts ensure physical and mental well-being. A portable Computer Vision system aims at detecting landmarks, obstacles and free surface, as well as traffic lights, buttons and crossings in front of the user. The goal is to use this information to help crossing streets more safely. The system provides information using acoustic and haptic devices, such as narration or sounds, as well as Braille, vibrating belts or armbands. Various interaction modes aim at offering a system that is adaptable to the users capabilities. As finding suitable crossings is most important for blind and visually impaired users, the project introduced a roadside-aware safe routing that prefers safe crossings and paths to shorter alternatives and gives instructions accordingly. 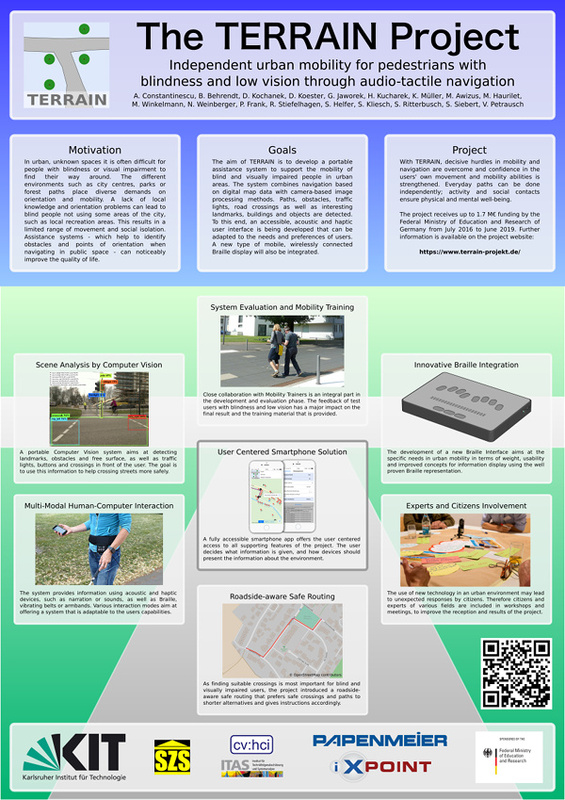 The use of new technology in an urban environment may lead to unexpected responses by citizens. Therefore citizens and experts of various fields are included in workshops and meetings, to improve the reception and results of the project. The development of a new Braille Interface aims at the specific needs in urban mobility in terms of weight, usability and improved concepts for information display using the well proven Braille representation. Close collaboration with Mobility Trainers is an integral part in the development and evaluation phase. The feedback of test users with blindness and low vision has a major impact on the final result and the training material that is provided. A fully accessible smartphone app offers the user centered access to all supporting features of the project. The user decides what information is given, and how devices should present the information about the environment. 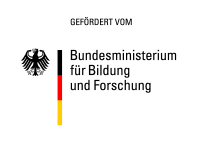 The TERRAIN project is sponsored by the Federal Ministry of Education and Research, Germany.